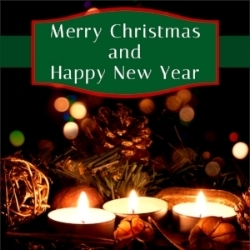 The Lehman Blog — Lehman & Lehman, Inc. Thank you for the opportunities you have given us to Transform Horizons for THIRTY YEARS! Thanksgiving is one of our favorite days of the year because it reminds us to give thanks and count our blessings. May your Thanksgiving be filled with blessings and joy! To see the 2018 edition of our Recipe Collection click here. The following is an article published in the National Recreation & Park Association's monthly magazine Parks & Recreation (June 5, 2018, by Kevin Roth, Ph.D. ). "We learned from the Local Government Officials’ Perceptions of Parks and Recreation study, which was published last fall, that elected and appointed local leaders agree their local communities benefit from the amenities provided by their local park and recreation agency. However, these same officials readily admitted that when their city, town or county must cut its spending, the local government service they target for the largest budget cut frequently is their park and recreation agency. Another of the report’s key findings suggests a major cause for this disconnect: Local government officials see parks and recreation as a part of the solution for many of the issues facing their community, including improving quality of life, preventing youth crime and enhancing residents’ health. They do not, however, perceive these amenities contributing to what they view as the most pressing issue: attracting and retaining businesses. Bridging this perceptions gap is critical in helping to stabilize, and even grow, park and recreation agency funding. A new study, commissioned by NRPA and conducted by the George Mason University Center for Regional Analysis, identifies how local park officials can better engage with those in the economic development community. The stakes of the report’s findings are critical. Through the development of lasting relationships, economic development leaders could become important park and recreation allies by helping defend budgets, promote new initiatives and create more engaged constituencies. As a part of the Promoting Parks and Recreation’s Role in Economic Development study, Drs. Terry Clower and Mark White talked with more than 70 park and recreation leaders and economic development practitioners across the United States. These conversations focused on how park and recreation leaders currently promote their agencies’ economic contributions, the nature and extent of the relationship between park leaders and economic developers, how both groups see these relationships evolving and details regarding relevant department initiatives. The researchers also spoke to site-selection consultants to better understand the role that quality of life (and parks and recreation) plays in site-location decisions. The researchers found that economic development leaders place a high level of value on park and recreation amenities for their efforts. For example, 72 percent of communities use images of urban parks and public spaces, outdoor amenities, and recreational and cultural facilities in their economic development marketing materials. Similarly, 70 percent of these communities make specific reference to quality-of-life considerations and/or present parks-related data and information in their economic development marketing materials. Rarely, however, do these marketing materials specifically call out the local park and recreation agency. Only a third of economic development marketing collateral reviewed specifically credited or cited the local park and recreation agency. Even rarer is for park and recreation agency leaders to have an actual seat at the table for their communities’ economic development efforts. Quality-of-life considerations (including high-quality parks and recreation) play a supporting role in site-location decisions. Quality-of-life factors are most important to firms that prioritize talent attraction and retention. This last point is critical. Cultivating strong partnerships within and outside the community is key to park and recreation departments being able to grow and thrive in the future. Strong partners can promote and advocate for parks and recreation. Partnerships also create new opportunities for park and recreation agencies to demonstrate their value to a community. To be successful, park and recreation leaders must commit to the “long game.” These relationships will not develop overnight, as external partners’ perceptions of parks and recreation likely will need to evolve. As a result, engagement efforts should include not only a park and recreation agency’s director, but also the agency’s entire leadership team. By including the agency’s senior staff in networking opportunities, these relationships will be more sustainable and will foster organizational relationships in addition to personal relationships with partnering agencies and organizations. I invite you to review the Promoting Parks and Recreation’s Role in Economic Development and then appraise the role your agency plays in local economic development efforts. The report includes examples and mini-case studies, where parks and recreation have been able to bridge the aforementioned perceptions gap and make a real positive mark in recruiting and retaining businesses (and their workers) in the community. Some of these efforts are rather elaborate, while others represent small steps that ensure that parks and recreation will play a more prominent role in future economic development efforts. Whatever the case, raising park and recreation’s visibility in driving economic development is a necessary step we all must embrace to ensure greater and more steady funding in the future." As is our custom, we have once again assembled some of our favorite recipes. This year we focused on Breakfast/Brunch ideas. To find these recipes - and our entire recipe collection - follow this link. Enjoy! Lehman & Lehman and the City of Mishawaka recently unveiled plans for a new outdoor bike park for kids — complete with BMX jumps unique to northwest Indiana, that will be among the new features of Mary Gibbard Park, which the city hopes to reopen next summer after a $1 million overhaul. So will a new playground, a low zipline, WiFi and a splash pad to replace the small pool in this park at the southwest corner of the city. Kids at nearby LaSalle Elementary School gathered in assembly Monday to see the final plans, swooning and cheering. Back in the spring, they’d drawn pictures of what they wanted in the park. Many of them, like the bike park, will be reality. Mishawaka Parks Superintendent Phil Blasko pulled out a mural with several of the kids’ wish-list drawings. That will be painted on a wall at the park, he told the students, explaining, “One day you are going to be able to say, ‘Hey, I helped build this park.’” If the kids take ownership, he believes, they’ll want to take care of it rather than vandalize it. Read more about the park features in theSouth Bend Tribune news article here. How Can Neighborhood Parks Attract More Users? "The United States is home to more than 108,000 parks, ranging from large regional parks and natural resource areas to sports complexes and small “pocket parks.” Most urban residents live in close proximity to one or more neighborhood parks, which are ideal places for people to engage in physical activity, such as sports, brisk walking and other forms of exercise. U.S. guidelines recommend at least 60 minutes a day of moderate to vigorous physical activity for youth and 30 minutes a day, five days a week, for adults. However, fewer than half of Americans currently meet these guidelines and that inactivity is contributing to a growing epidemic of chronic disease. Given that park space and facilities already exist, what would it take to encourage people to use this space to be more physically active? We have updated the Recommended Reading page on our website with a new magazine. Check out Tiny Living Solutions for the latest trends in Tiny Houses and Pocket Neighborhoods. The City of Mishawaka's Historic Preservation Commission presented Lehman & Lehman with an Award for Adaptive Reuse "for their outstanding efforts to preserve and bring a new use to..." the building that houses our office. We purchased and moved into the house in 2002 after some interior renovation. While we knew the house was built in 1915 for $6,100, we were surprised to learn that one of the prior owners was former Mishawaka Mayor and Postmaster, John Herzog. We are proud of our prairie-style office with its signature green tile roof and thank the Commission for the award. As you will see in this video, Chuck Lehman, President of Lehman & Lehman, was selected to assist with the Garden design. The Bethel College Unity Garden, or BUG, will join more than 50 other area gardens affiliated with Unity Gardens, a non-profit group started by Sara Stewart, a graduate of Bethel’s Master of Science in Nursing program and a 2013 recipient of the college’s Professional Achievement Alumni Award. The mission of Unity Gardens is to improve community health through access to fresh fruits and vegetables while bringing together a diverse community. In helping the BUG get off to a good start, Unity Gardens will provide soil testing, seeds, and the help of a master gardener. Students, faculty and staff gathered in November to dedicate the garden site, and planting will begin in the spring. Community members are encouraged to stop by the BUG, located near the corner of Russ St. and Forest Ave., and join in the gardening efforts – whether through planting, weeding, watering or enjoying the fresh seasonal vegetables and herbs as they become available. For updates on upcoming events, volunteer opportunities and a ripening schedule, visit the BUG Facebook page, Facebook.com/BethelCollegeBUG. Lehman & Lehman was pleased to lend a hand to this worthwhile community project. The City of Mishawaka recently added inclusive play equipment at Hillis Hans Park. In 2011 Lehman & Lehman designed plans for a makeover of Hillis Hans, a neighborhood park south of downtown Mishawaka, that included a new picnic pavilion, new lights, a new brick sign, walking paths and new curbs and street surfacing around the park. 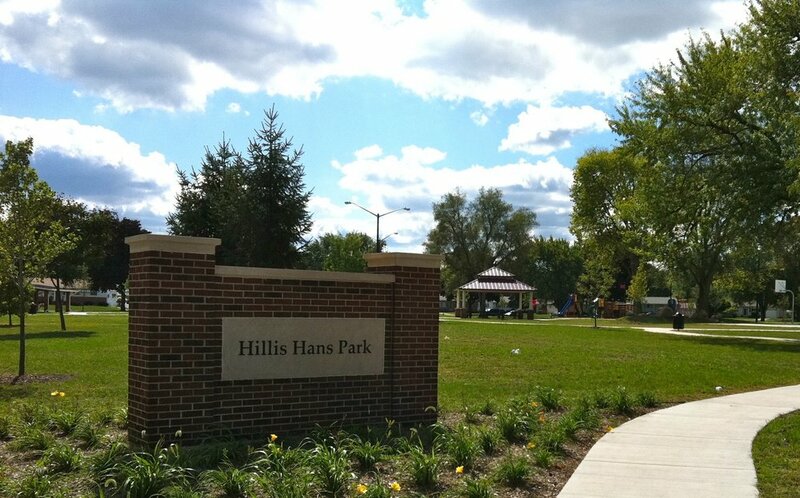 We are proud to have also been a part of these new additions to the Hillis Hans Park. Read the South Bend Tribune story here. 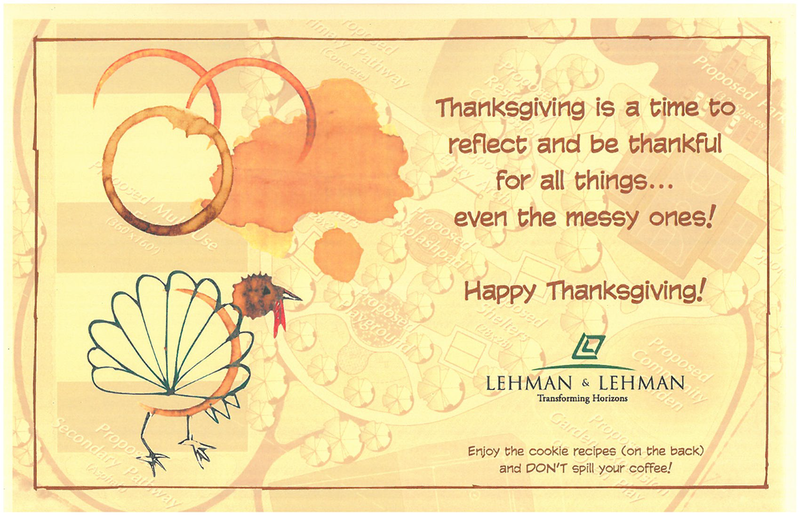 Wishing you all a Happy Thanksgiving – and that you make the best of any messes you may encounter! For 15 years we've shared some of our favorite recipes with you. This year we feature cookies! Click here for the entire Recipe Collection. The upperclassmen council of Bethel College (Mishawaka, IN) hosted a senior forum that led to the idea of building a prayer garden for the Class of 2016's class gift to the college. Lehman & Lehman was then commissioned to develop a conceptual plan. The goal was to provide a peaceful place to use for intentional prayer. 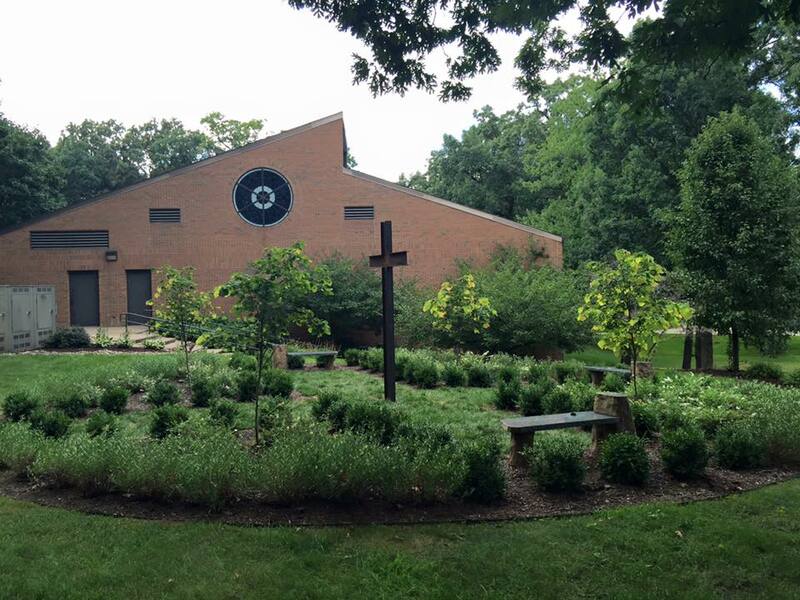 A prayer garden also allows a space for solitude and quiet, and to get away from dorms, noise and distraction. Bethel College recently held a Prayer Garden Dedication for this new addition to their college campus.